Hello everyone, today we’re going to be taking a look at some of the most popular ‘no battery watches’ available for men. So what counts as no battery watches? There’s actually quite a few different routes you could go down. Automatic or mechanical watches don’t require batteries. You’ll also find that Eco-Drive or other solar alternatives also don’t need any battery changes so these might be suitable for you too. And I guess you wouldn’t want to discount kinetic watches either that transfer kinetic energy into a quartz movement, using a battery to hold the power, but not requiring any new batteries. One of my best lists for watches without batteries is my 100 best automatic watches under £1000. In that article, I feature a huge range of impressive watches without batteries. Alternatively, my best watches under £500 also features many non battery watches. So below I’ve featured a small sample of 10 popular watches without batteries. 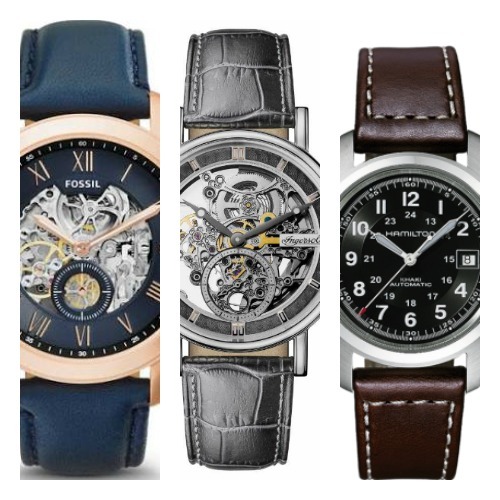 I’ve included a good mixture of affordable and high end watches for you to take a little look through to see what sort of watch is right for you. As always if you have any questions about any of the watches featured today just comment below and I’ll try to assist you as best I can. For now, enjoy today’s list of the top watches without batteries. The first batteryless watch I’m featuring is this popular timepiece from Fossil. 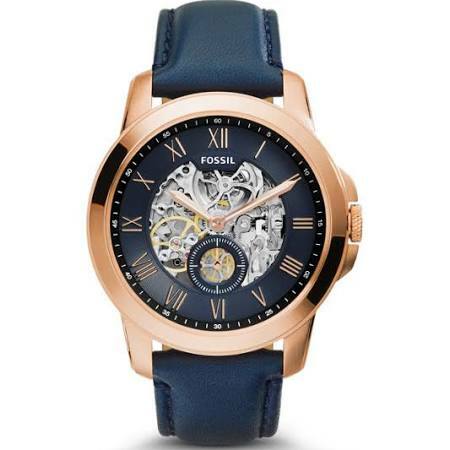 This is a very popular Fossil watch that’s actually fairly affordable. This timepiece has a large 43mm rose gold PVD plated casing that has a thickness of 12mm. It’s been fitted with this beautiful blue leather strap that fastens with a buckle style clasp. I’m a big fan of these skeleton style dials on automatic or mechanical watches. This model showcases quite a large amount of the movement and also features an exhibition caseback so you can view the movement through the rear of the watch too. The outer rim of the dial is finished in blue with PVD gold plated Roman Numeral style hour markers which stand out nicely. This no battery watch is powered by a Japanese made automatic self-winding movement. It charges itself up via the movement of your wrist and never requires a battery. A mineral crystal glass protects the front of the watch from scratches and shattering. It also has a 50m water resistance rating that’s likely to come in useful. Not bad for the first affordable timepiece in our ‘no battery watches’ list. You can read my full ME3054 Fossil watch review here soon. The next watch without a battery that I’m featuring is from Rotary watches. This brand has many affordable skeleton automatic watches available that don’t require batteries. 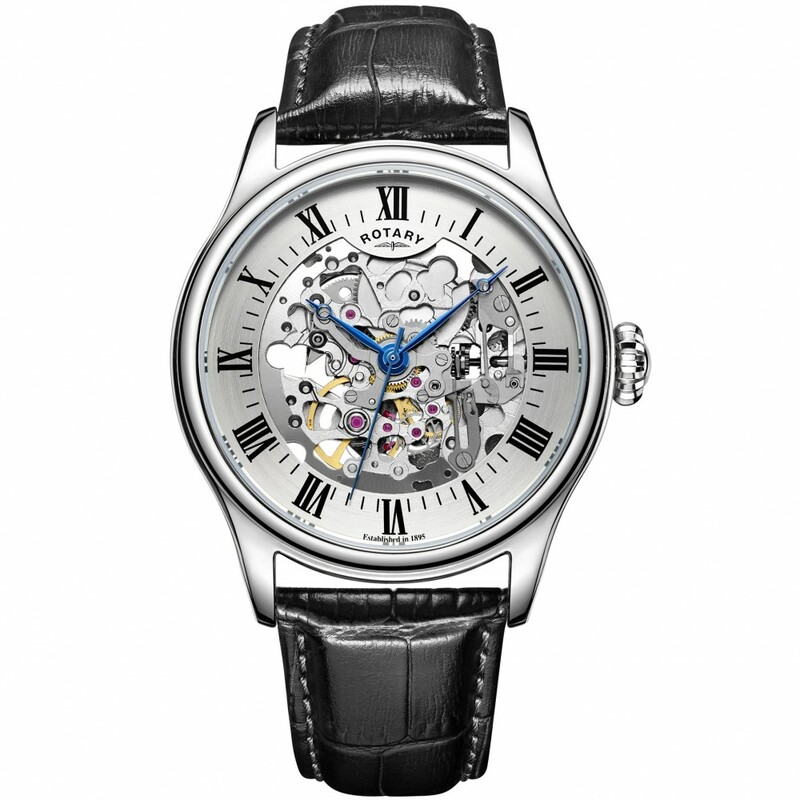 This classic skeleton watch features a large 40mm stainless steel casing with a thickness of 11mm. The strap is made of a soft genuine leather in black and fastens with a buckle style clasp. Again we have a nice amount of the exposed mechanism on show with this non battery automatic skeleton watch. They’ve used black Roman numeral hour markers that are applied to the silver coloured outer ring of the dial. I’m a big fan of these blue tinted hands that I feel add a nice touch of colour to the design. At the heart of this timepiece is an automatic self-winding movement making it another popular choice for those seeking watches that don’t need batteries. A mineral crystal glass has been specially hardened to give this watch a good level of scratch and shatter resistance. It also features a basic water resistance rating. You can read my full Rotary GS02940/06 watch review here. Next up on today’s list of the top watches without batteries is this affordable self-winding military style timepiece. 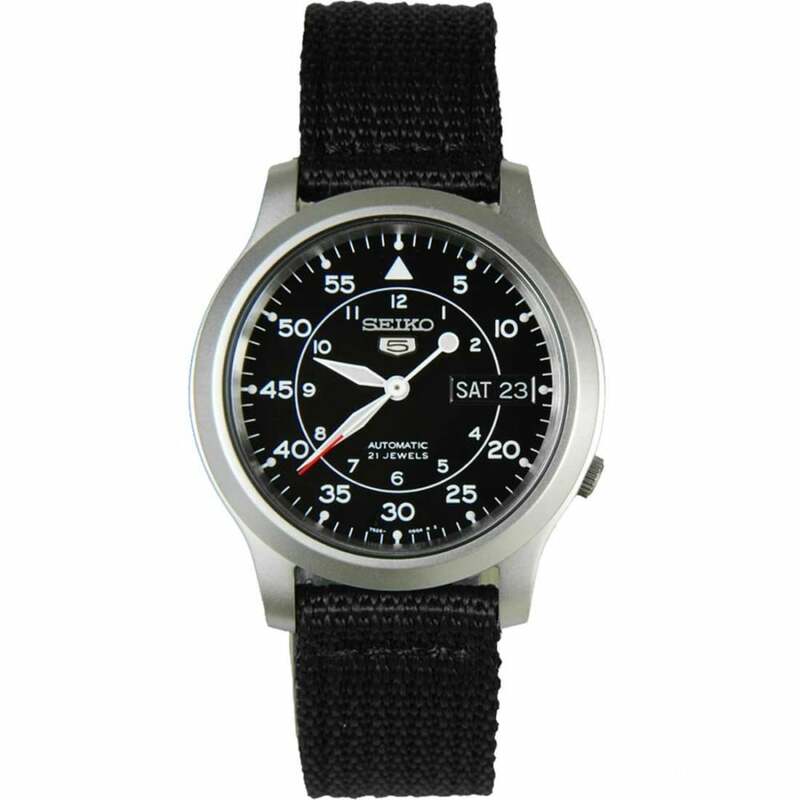 This watch is part of the popular Seiko 5 series which was designed to offer quality yet affordable automatic watches to the masses. It features a smaller 36mm stainless steel casing that has an 11mm thickness. A common trait of a lot of the Seiko 5 timepieces is the crown at the 4 o’clock position. The strap is made of a comfortable fabric canvas and fastens with a reinforced buckle clasp. It’s quite common for these type of watches to have easy to read high contrasting displays. There’s also a useful day and date function at the 3 o’clock position on the dial which could be of use to people. The glass on the front of the dial and exhibition caseback is made of a mineral crystal glass. This is specially hardened to offer a good level of scratch and shatter protection. This non battery watch even has a 30m water resistance rating. You can read my full Seiko SNK809 review here. 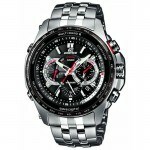 When it comes to watches without batteries Bulova have quite a few affordable options available. They’re one of my favourite brands, you should check out my Bulova watches review if you’d like to learn more about the brand. The casing of this Bulova automatic watch is made of stainless steel and has a diameter of 42mm with a thickness of 15mm. The strap is made of a soft genuine leather in brown to match up with the colour of the dial. It fastens with a buckle style clasp. The dial features a key-hole exhibition design that showcases just a small amount of the automatic movement that powers the watch. They’ve used rose gold PVD tinted detailings for the hands and Roman numeral style hour markers. It’s another affordable watch without battery as it runs on a Japanese Miyota self-winding automatic movement that can be seen fully through the exhibition style caseback. Like the previous watches, this model also has a mineral crystal glass that protects from scratches and shattering. 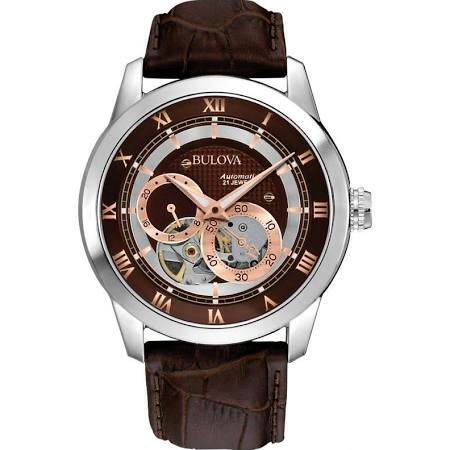 You can read my full Bulova 96A120 watch review here. Another option when it comes to looking for a watch that doesn’t need a battery change is a knietic watch. Kinetic watches charge themselves up via the movement of your wrist, similar to a self-winding automatic watch. However, it has the ability to store the excess power and also uses a quartz style mechanism to operate the watch. These have proven popular as they can have huge power reserves and stay running for months at a time on a full charge. This non battery watch is built with a 42mm titanium casing which is lighter and stronger than stainless steel. You can find more popular titanium watches here. The thickness of this titanium casing is approximately 11mm. This has been matched up with a sturdy titanium strap that fastens with a push release fold over clasp. The dial has a simple and easy to read display with silver coloured baton style hour markers and hands on top of a black coloured background. There’s a useful date display at the 3 o’clock position. 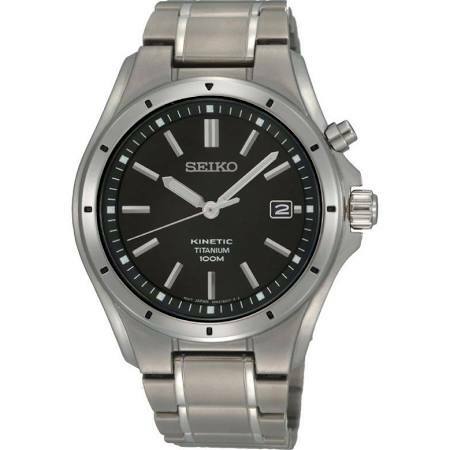 As previously mentioned, this Seiko batteryless watch runs on a kinetic quartz movement that’s accurate and reliable. A mineral crystal glass protects the dial, it’s specially hardened to offer a good level of scratch and knock resistance. This Seiko timepiece also has a 100m water resistance rating which is good to see. You can read my full Seiko SKA493 watch review here soon. 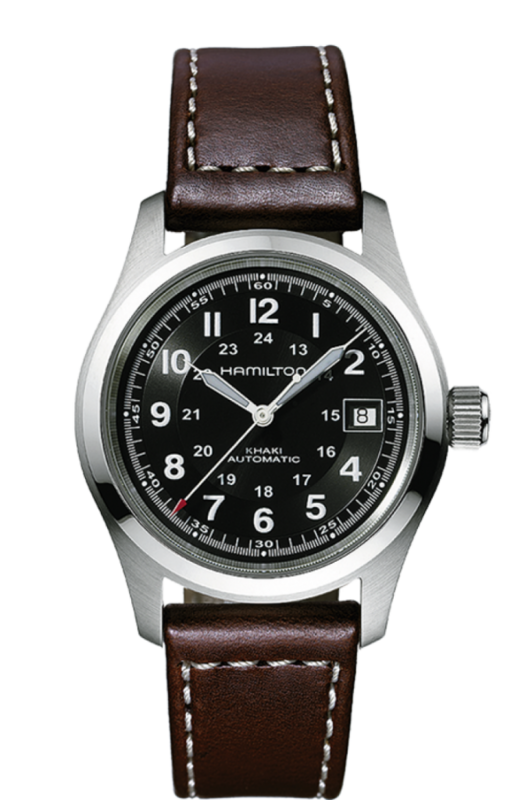 Up next on today’s list of ‘no battery watches’ if this ever popular Hamilton Khaki automatic watch. This Swiss made automatic watch features a 38mm stainless steel casing with a depth of 11mm. The strap is made of a soft genuine leather with contrast stitching. It fastens with a classic buckle style clasp. The dial has a classic design to it with a high visibility contrasting finish. The numeral style hour markers are easy to read and stand out against the black background. There’s also a handy date display at the 3 o’clock position. If you’re looking for a watch without a battery than picking an automatic watch that runs on a Swiss ETA 2824 self winding movement isn’t a bad choice at all. You can actually see this movement working away through the rear exhibition caseback of the timepiece. A highly scratch resistant sapphire crystal glass protects the front and rear of the watch. It also has a 100m water resistance rating which is great to see. 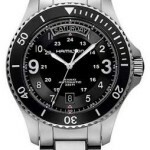 You can read my full Hamilton H70455533 watch review here soon. Next up in our watches without batteries article is this Swiss made chronograph automatic timepiece from Tissot watches. 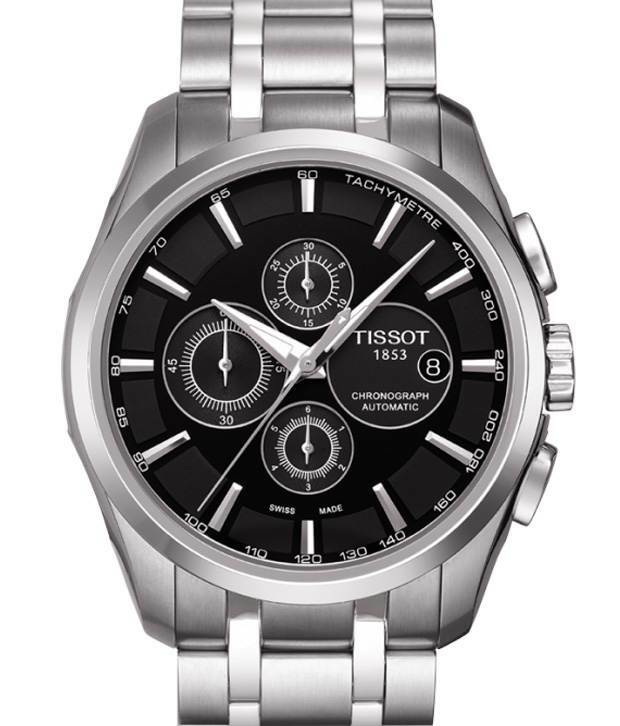 This men’s Tissot watch is built with a large rounded 43mm stainless steel casing that has a 15mm thickness. The strap is also made of stainless steel and fastens with a push button deployment style clasp. This Tissot Couturier has a smart and stylish dial design with slim baton style hour markers and pointed hands that feature a coating of lume. There are 3 chronograph sub dials as well as a small date function on display. Powering this Tissot watch is a Swiss made automatic movement. These are powered by the movement of your wrist making it a watch with no battery. You can see a small portion of this movement on show via the port hole exhibition case back. Again we have a sapphire crystal glass that gives this timepiece an excellent level of scratch protection. It also has a 100m water resistance rating. You can read my full Tissot T035.627.11.051.00 watch review here soon. When it comes to watches that don’t need batteries this next brand has quite a large selection available. I’d recommend checking out my Ingersoll watches review if you get a chance. 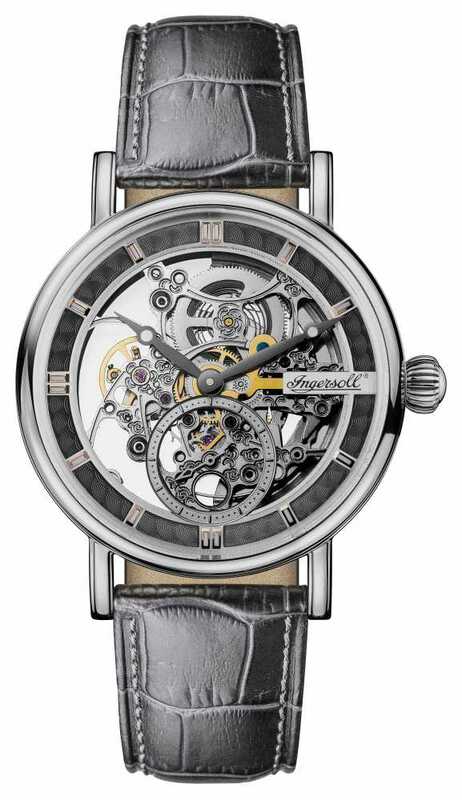 I have to admit I love the design of this automatic self-winding watch from Ingersoll. It’s built with a stainless steel 40mm casing that has a thickness of 13mm. It’s been paired up with a black genuine leather strap and fastens with a push release three fold special clasp. The dial design is stunning, you can see a huge amount of the automatic movement working away which I really like the finish of. The seconds are displayed in a separate sub dial at the 6 o’clock position which I’ve been quite a fan of, you only have to look through my best minimalist watches to see why. This watch without a battery is powered by a self-winding automatic movement, that means the movement of your wrist charges up the watch. They’re a very popular choice for people looking for higher end timepieces, you can find more of the best automatic watches under £1000 here. A scratch resistant mineral crystal glass offers a good level of protection from scratches and shattering. It also features a 50m water resistance rating. You can read my full Ingersoll I00402 watch review here soon. When it comes to luxury watches without batteries a brand such as Muhle Glashutte could be considered. This is a high end German made automatic chronometer watch. It’s built with a stainless steel 41mm casing that has a thickness of 13mm. The strap is made of a genuine leather and fastens with a deployment style clasp. The dial has a very smart finish to it with 3 chronograph sub dials as well as a day and date function on display. I’m a fan of these silver coloured slim style watch hands that add to that elegant look. At the heart of this German batteryless watch is a high end ETA 2892 automatic movement with Grand Date module Jaquet 3532, Muhle Version. It’s a chronometer movement which makes it extremely accurate. You can see this movement through the exhibition caseback on the rear of the watch. A sapphire crystal glass protects the front and rear of the watch with a very high level of scratch resistance. It also has a 100m water resistance rating. 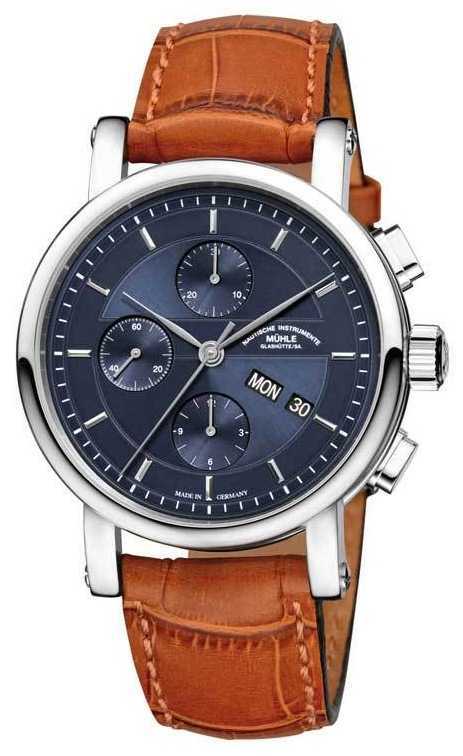 You can read my full Muhle Glashutte M1-33-76-LB watch review here soon. 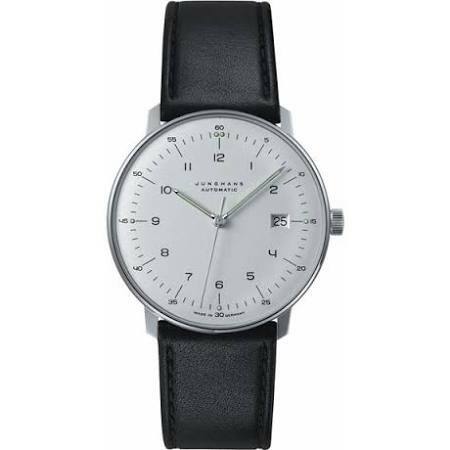 In at number 10 on today’s list of no battery watches is this beautiful simplistic watch by Junghans. The Junghans Max Bill is another high end German made automatic timepiece. This elegant and refined timepiece has a beautiful minimalist design to it. The watch is with a 38mm stainless steel casing that has a slim 10mm depth. The strap is made of a genuine black leather and fastens with a buckle style clasp. I mentioned earlier on that this is a minimalist watch, it featured just the bare necessities with slim hands and numeral hour markers as well as a small date function at the 3 o’clock position. The matte silver plated dial has a beautifully curved neat design to it. At the heart of this watch without battery is a Junghans self winding automatic mechanical J800.1 movement for reliable and accurate timekeeping. A curved Sicralan coated hard plexiglass protects the dial from scratches and shattering. You can read my full Junghans Max Bill review here soon. Thanks for taking the time to read through today’s list on the top ‘no battery watches’. My personal favourite is the Junghans Max Bill, although it’s well out of my current price range sadly. What was your favourite model from our list of watches that don’t need batteries? Comment below and let me know. Are Seiko automatic watches good? 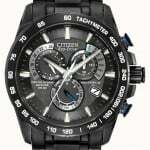 I’ve been looking for some non battery watches for a while. I just don’t see the point in constantly having to pay someone to change a battery, it’s about a tenner where I live. Would much rather have something nice looking like these.